Relay-cropping, is when a new crop is sown in another already growing crop with a different harvesting date. For instance: winter barley + sorghum. This is very different from double cropping, where 2 crops are grown one after the other during the same year in the same field. To read more, in 2018, technical institute Arvalis led comparative studies on sorghum under 3 modalities: traditional crop (only sorghum), relay cropping –barley + sorghum) and double cropping (barley then sorghum). sorghum was sown on 9 May with 40 seeds/m², with 58cm spacing. this trial combines winter barley and sorghum. Winter barley is sown in October or November, and sorghum is sown in May in the middle of the barley. The barley is sown with a grain seeder alternating 2 open rows and 2 closed rows. The density of barley for the relay-cropping field (150 seeds/m²) is therefore twice lower than in a “traditional” field (300 seeds/m²). Then the reste of the cultivation of barley is the same as usual. Sorghum was sown on 9 May amidts the barley using a precision planter adjusted to go in between the barley rows. The density of sowing was 40 seeds/m², exactly the same as “traditional crop” sorghum. Double cropping sorghum was sown on 29 June after the harvest of barley, at 40 seeds/m². An early variety was chosen. 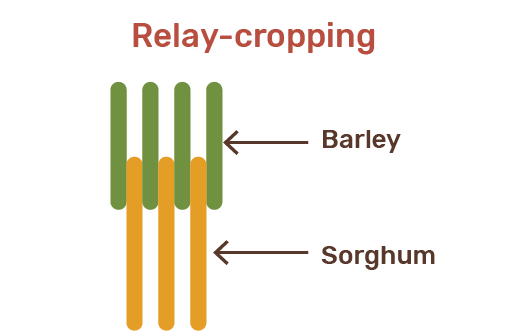 Which is only 5% lower in relay-cropping as compared to traditional crop barley. The other years, the yields were 10 to 15% lower. Double cropping : 37.2qx/ha, 26.9% humidity, harvested on 31 October. 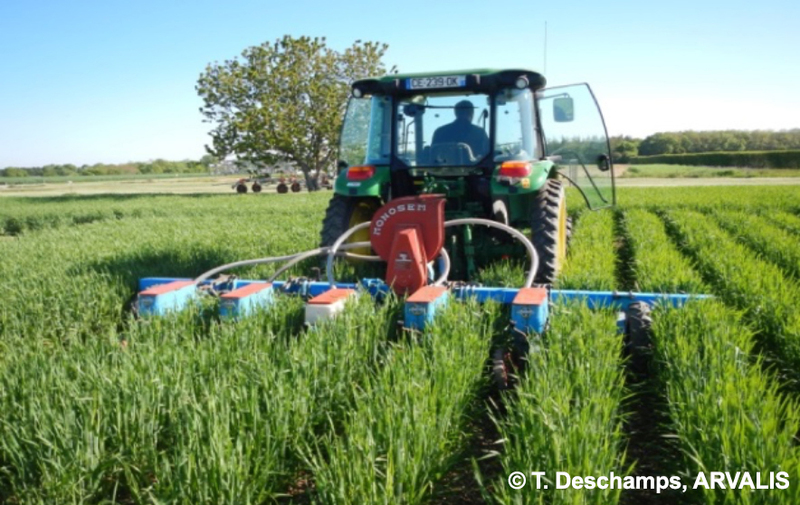 It is important to note that this trial was implemented in an irrigated field (irrigation mid-May for the barley) and then 5 summer irrigations (every 15 days from 2 July). In total, 193 mm water were added. In this context, relay-cropping sorghum gives a higher yield than double-cropping for humidity lower by 6%. This is a promising result, but mist be confirmed by other trials. Cultivating 3 crops in 2 years could be an interesting opportunity, but it is however indispensable to measure the production costs and to manage the water deficit. The seeder and tractor need to be adapted to the right width to go between the rows of barley. The elements were slid on the tube, and the training wheels were put on the outside, instead of seeding elements. Pans (Flexxifinger) were placed under the harvester in order to bend but not cut sorghum during the harvesting of barley. Sorghum crushed by the wheels during the barley harvest was not very impacted this year.